Get your bean bag filling in a Funnlweb Bag: Beads come delivered in a Funnelweb bag and an attractive, re-usable Transport bag with handle. Take your Funnelweb bag out. Get ready to fill your new bean bag. 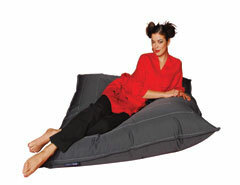 Zip your Funnelweb bag to the inside gusset of your Ambient Lounge bean bag. Zip all the way to the end so there are no gaps. Tip your Funnlweb bag and let gravity do all the work. Open the gusset wide and beads will fall into your cover with ease and without any mess! Test your filling levels. When happy, unzip the Funnelweb bag carefully. Be careful of static beads near surface. 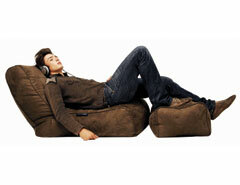 Relax and Enjoy your designer Ambient Lounge bean bag! Filling your bean bag has never been so easy. No longer will you need to be carting massive bags around shopping centres, spilling bean bag beans all over your lovely home, wrestling with plastic bags and get half the family to help you fill or top up a bean bag. Ambient Lounge bean bag filling come in the Patented Funnelweb Zip-and-tip Bag - delivered in an environmentally friendly re-usable outer transport bag - directly to your door. It's a one person job that's quick, convenient and cheap. Now with the Funnelweb system you will never need to spill the beans. The exclusive Funnelweb® zip-to-zip system that takes all of the hassle out of filling and emptying Ambient Lounge® (and Funnelweb compatible compatible) bean bag chairs. In 30 seconds, you zip your inner bag to the bean bag and zip the beads in. 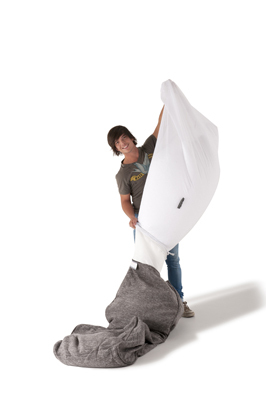 The advantages are not limited to convenience - caring for your bean bag cover is also easier. You can unfill and clean your cover with one person in a matter of seconds. 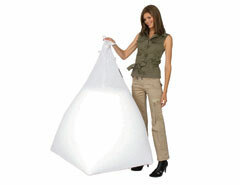 The funnelweb bag can also be stored INSIDE a filled bean bag for ease and convenience of unfilling. 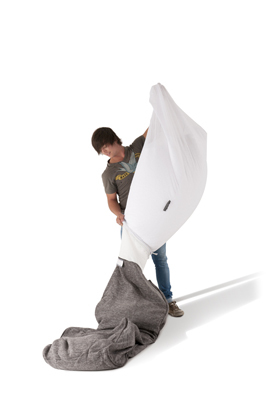 As a guide, most Ambient Lounge standard range bean bags (such as Evolution Sofa, Studio Lounger, Conversion Lounger) take around 300 litres of filling, which can be found in a standard Funnelweb and transport bag. Ambient Lounge Gold Class range (such as Twin Lounger, Acoustic sofa, Butterfly Sofa) take between 400 - 600 litres of beads and all have multiple filling gussets due to the Ambi-spring system. 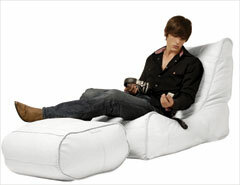 Ambient Lounge ottomans, Pet Lounge and Versa Tables require between 150-200 litres of filling. Despite what you might think, Bean Bag filling quality is not all the same. Depending on you country, supplier and region, the polystyrene bean bag beans may be large or small - which will impact the way they feel and perform inside your cover. As a general rule, the smaller the beads, the better - the more dense they are and the less they will compress after use. We recommend the use of beads 2-4 mm in diameter for the best results. If you are looking to buy bean bag filling to refill one or more of your bean bags, please contact your local Ambient Lounge dealer. They will sell bean bag beads in a Funnelweb outer bag that conveniently zips onto your cover. Buy them for top ups or refill. If you own a bean bag - after a while, you may find that it doesn't seem as comfortable as it used to be. This is probably because the beans have been compressed. Buy good quality polystyrene beads and bring the comfort back. As a general rule, the smaller the beads the better. 2-4mm diameter beads are preferred size. This means the medium-term compression will be lessened, it should be much quieter and the many more 'balls' inside to give you a greater comfort/massaging effect on your body. Remember a good quality bead means greater quality lounging. 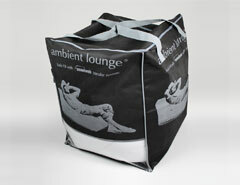 Ambient Lounge® is a worldwide brand of bean bag covers and filling. The group has representation in most major countries. The Studio is sleekly designed so that your body sinks into the bean-filled chaise lounger in a naturally comfortable position. 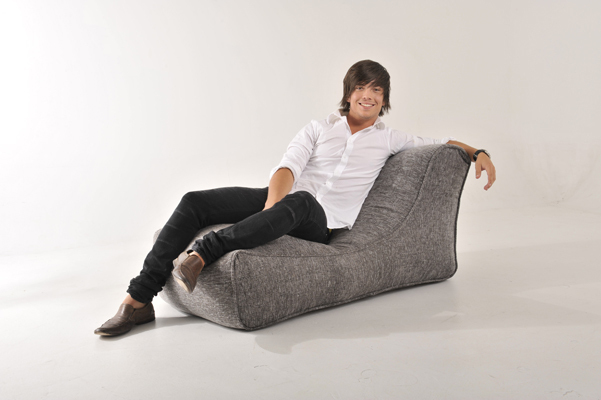 One of the world's most comfortable bean bags, the Evolution eclipses your traditional sofa in both looks and function. 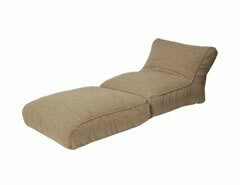 The Conversion Lounger can be a compact bean bag chair or stretch out to become a full body sunlounger. Quilted with feature stitching and clean lines, the Zen Lounger is Spiritual harmony for your mind, body and soul. Inspired by open spaces, clean living, freedom of mind and creative expression. Nothing beats the feel and quality of Genuine Leather.